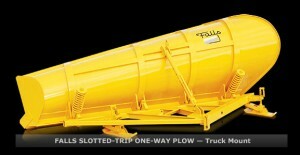 Towmaster is an authorized distributor for Falls Plows. 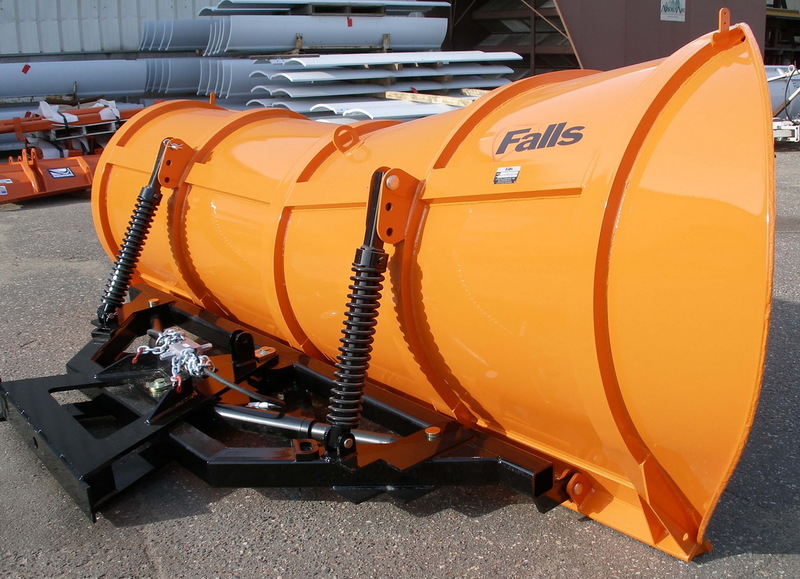 Falls Plows manufactures tough, top-quality, industrial-grade snow handling equipment including Snow Plows, Snow Wings, Scrapers, Spreaders and Scarifiers. Reliability and innovation keep them the Midwest’s largest supplier of advanced design, high-quality truck, wheel loader and motor grader-mounted snow handling equipment. 8, 9, 10, 11, and 12-foot cutting edge lengths. 3.5″ diameter double-acting hydraulic cylinders. Nitrided cylinders for increased corrosion resistance. Trip edge or trip moldboard available. Equipped with Falls’ exclusive Wing Lock Valve with built-in relief. Double-boxed wing construction eliminates twisting. Two (2) cylinder control for precise positioning. Works in conjunction with Underchassis Scraper to eliminate windrows. Shown with optional nitrogen-accumulated hydraulic push bar extension. 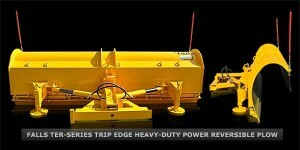 Hydraulic power front sideshift available. Shown with optional nitrgen-accumulated hydraulic push bar extension. Convert any truck (3-ton and up) into an efficient snow fighter. Clear up to 20 feet in one pass. Works in combination with one-way plows, reversible plows and v-plows. Maximize your machine and manpower. 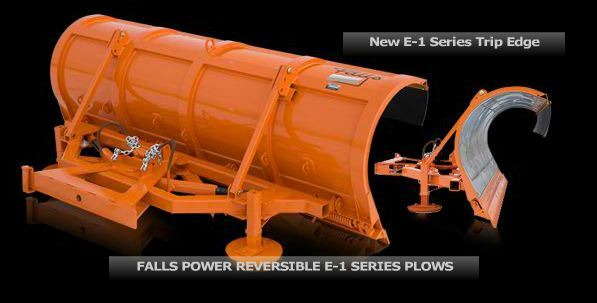 Quick coupler plow units attach to push plate with 2″ diameter pivot bolt allowing desired snow plow oscillation for cleaner plowing. Five rolled, heavy channel iron ribs provide maximum rollboard rigidity. Horizontal channel braces reinforce transverse stability. 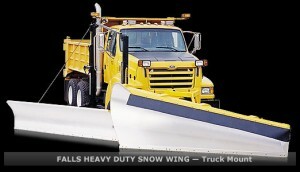 Moldboard may be tilted forward or back depending on snow and road conditions. Bottom support structure is constructed of 4″ x 4″ x 3/4″ A-36MOD angle iron reinforced between bolt holes. 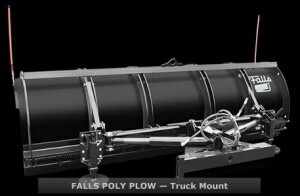 Heavy-duty tubular push frame distributes plowing stresses across full length of moldboard. Two heavy-duty single-acting reversing cylinders for quick control with hydraulic cushion valve for circuit protection. Four rolled, heavy channel iron ribs provide maximum rollboard rigidity. Horizontal channel braces reinforce transverse stability. Bottom support structure is constructed of 4″ x 4″ x 3/4″ A-36MOD angle iron reinforced between bolt holes. Discharge end is reinforced with an additional 1/2″ x 7″ 1045 steel plate. 3/8″ landslide plate has renewable nose. Three (3) torsion spring trip sections. Heavy-duty, simplified oscillating A-frame, 4″ x 4″ x 1/4″ (101.6mm x 101.6mm x 6.35mm) square tubing. 1-1/2″ (38mm) center pivot rod. 1/2″ (12.7mm) thick end ribs. 3/4″ (19mm) chrome-vanadium torsion springs, two (2) per section. Optional coatings available for moldboard face. Standard screw adjustable mushroom shoe assemblies. Double, overlapping, 7 gauge (5mm) and 10 gauge (3mm), formed box sections provide full length reinforcement. 5 rolled, heavy channel iron ribs deliver maximum moldboard rigidity. Horizontal braces provide reinforcement and stability. Moldboard tilt feature provides the flexibility to tilt the moldboard forward or back depending on snow and road conditions. 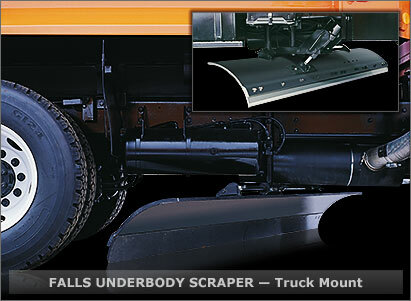 Precise moldboard curvature provides proper lift, roll and throw of snow for maximum efficiency and easier plowing. Discharge end is flanged and additionally reinforced with 1/2-inch roundbar. Bottom support structure is 4″ x 4″ x 1/2″ A-36 MOD angle iron reinforced between the bolt holes. Push frame attaches at 4 pins – 1-1/4″. A-frame push plate is double tubular construction. hitch unit will attach through large diameter hinge bolt (2″) to allow the plow to oscillate to follow changing road contour. Heavy-duty reversing push frame distributes plowing stress across the entire length o fthe moldboard. Optional slotted trip or compression spring trip tilting bars. 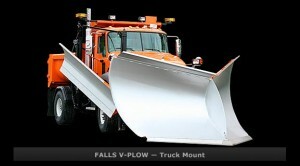 90 degree included blade angle provides the easiest pushing V-Plow in the industry. Shoe adjustment, including nose shoe, is made easily without the use of tools. 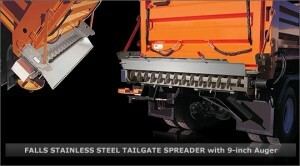 Easily adaptable to major quick hitches and conventional hitches. 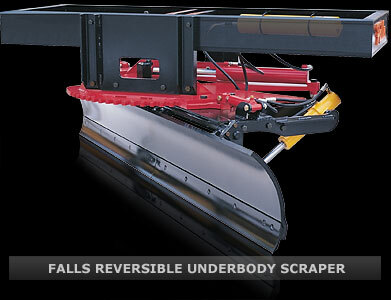 Lift and roll of the moldboard discharges snow with ease and in one fluid motion. Smooth rolled moldboard for a clean lift, roll and throw of snow. Discharge end is rolled and formed for additional strength. In addition, a 1/2″ round bar is formed and welded to the rib for greater stiffness. The 4″ channel iron ribs extend from the top moldboard angle to the bottom support angle. Top moldboard angle is 2″ x 2″ x 3/16″ angle. Bottom support angle is 4″ x 4″ x 3/4″ A-36 MOD angle boxed between the bolt holes. Discharge end is reinforced with an additional 1/2″ x 7″ 1045 steel plate. Screw-adjustable oscillating shoes are standard. Landslide plate has renewable nose. Fixed-angle push frame is heavily reinforced and attaches to the moldboard at 5 points with 1-1/4″ pins. Hitch adapter and swivel plate allow plow to follow the changing road contours. Rigid tilting bars are standard. 500 psi pressure reducing valve included. Two double-acting 3-1/2″ diameter revesible cylinders. Optional power lock pins available with monoblock sequence valve. Compact design for easier installation and better blade contact angle. Two 1/2″ x 6″ DBC cutting edges. Hydraulic Accumulator System for consistent pressure. 1″ thick one-piece circle plate. 1-3/4″ cold-rolled steel hinge shaft. Moldboard is 1″ x 20″ with a 17″ radius. 3″ cushioned hydraulic cylinder cylinder. 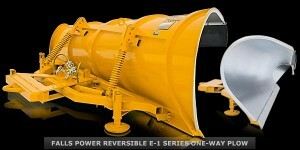 May be installed in combination with plow and wing. 1-1/2″ cold-rolled steel hinge shaft. Moldboard is 3/4″ x 20″ x 10′, 17″ radius. Full Length Hinged Top Cover for Dumping Operations with Two (2) Position Gate Opening. Oversized hopper opening to reduce bridging. Parker Torqlink TBO and Roller Stator hydraulic motors. Self-leveling spinner with 6 flights. Hopper constructed of 7 gauge stainless steel. Berm chute delivers flow to road shoulder. End plates constructed of 1/4″ stainless steel. Right or left hand discharge. Auger shaft tapped to accept speed sensor. Direct hydraulic shaft and spinner drive. Full-length hinged bottom cover with Easy Latch System for easy clean-out in any weather. Full-length hinged top cover with 2 position flow-control gate opening for fast, one-person dumping operations. This is a modified version of the 29″ Husting Hitch. It has been modified to fit Falls Standards so now it’s stronger, more flexible and reliable. A chain left has also been added to the truck-mounted portion. This delivers a smooth, “no pry” lifting action. 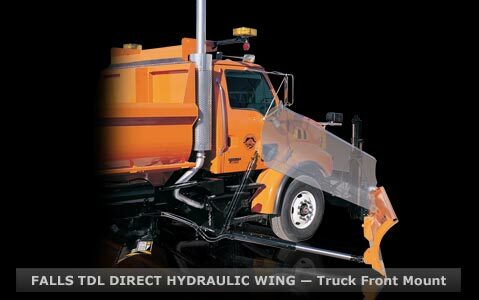 The plow mount is made of rugged 8″ x 4″ x 1/2″ angle iron with the entire length of the sliding pin slot reinforced with 1″ square and 5″ x 3″ x 5/16″ angle iron. It also has a center pivot pin which allows oscillation for closer manufacturing tolerances between truck and plow portions. The Falls X4 Pin and Loop Quick Coupler features a plow-mounted loop and truck hitch-mounted coupler that delivers coupling that’s fast and reliable. The truck hitch coupler is a positive drop-in, lever actuated pin. This hitch system is interchangeable with other similar loop couplers. 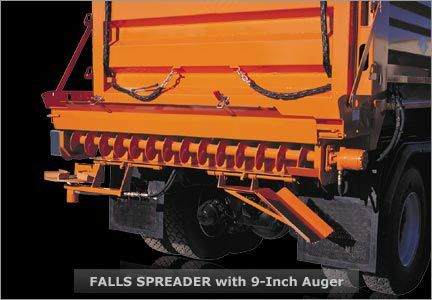 The Falls #46B Hitch System is the very finest in plow and wing hitches. 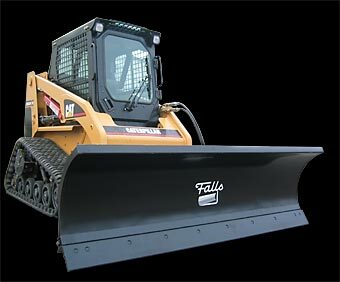 The Falls Custom Frame Hitch is ruggedly constructed and designed for very heavy snowplowing and snow-winging service in all truck classes. Constructed of 1/2″ thick steel plates and heavily reinforced throughout. The Falls X8 Jaw Quick Coupler is a two pointed latch system which keeps the moveable components attached to the snow plow. The solid components are apart of the truck-mounted assembly. This hitch system is interchangeable with other similar jaw couplers. 1.5″ rod, 2″ diameter, 11.75″ stroke. Adjustable Safety Trip Cutting Edge to minimize impact on plow and loader when encountering hidden obstacles.